MyBrute has asploded the internets. It’s gained so much attention that a MyBrute Guide is needed for you to create the ultimate BRUTE! Here’s a newbie guide to anyone interested in the game. Post a comment if you want to contribute to the MyBrute Guide. Credits due will be given to your contributions. What is My Brute? MyBrute is a free online flash game that’s free, online and a flash game (did that make sense? o.O). Where you battle other brutes and go like every other RPG, and that’s level up and beat more brutes! You’ll start off by customizing your Brute, but even before that, you should start off by seeking a Brute Master to sign up. Just click the link above, specify a name for your Brute, and customize his/her looks. After you battle (and no doubtly lose to) your master, just add a password so that only YOU can your Brute. Brutes gain experience and level up from fights. Each time they level they have a chance to increase one of their three stats strength, agility and speed. They also have a chance to gain a new weapon to use in battle, a new specialty, or a new pet. 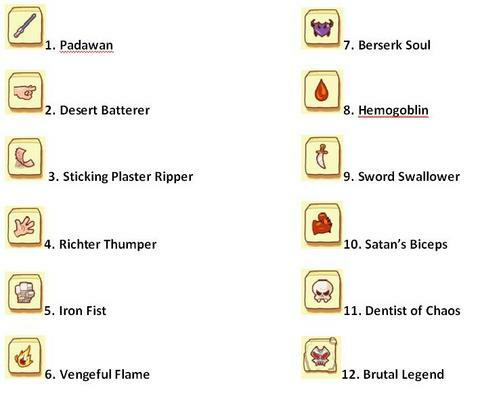 There are a total of 28 specialties a brute can gain every time they level up. Specialities are passive abilities that make your brute stronger, for example a bonus to stamina, strength, or damage mitigation. Supers are powers that your brute can activate during battle, like throwing a bomb or drinking a potion. Weapons make your brute’s attacks much more powerful. Some weapons make you attack often for small damage, some weapons miss alot but deal alot of damage, and some weapons do mediocre damage but hit often. Fan: Hits a few times for 5 damage. Can counterattack too. Leek: Does alot of attacks but hits for only 5 damage each time. Tennis Racket: Does below average damage, but always retaliates and sometimes blocks an attack. Knife: Does below-average damage, but always hits and grants bonus attacks. Sai: A samurai-style knife that looks like the tip of a trident. Very similar to the traditional knife, but does a bit less damage. Keyboard: Does multiple attacks doing average damage. Not too impressive! Ninja stars: Fires a volley of ninja stars at your opponent. Does average damage. Birdlike Thing: Throws something that looks like a bird to your opponent. A throwing weapon that hits for below-average damage. Baton: A simple stick that does low damage but sometimes blocks your opponent’s attacks. Frying Pan: Does average damage and can block blows. Lance: A poking device. Does below average damage and sometimes retaliates your opponent’s attacks. Broadsword: A standard sword. Does average damage, sometimes does more than 1 hit. Mammoth’s Bone: A large bone. Does average damage. Overall a pretty solid starting weapon. Trident: Similar to the whip, sometimes does multiple attacks and retaliates your opponent’s attacks for average damage. Whip: Does average damage, and makes your character attack a LOT and retaliate your opponent’s attacks. Noodle Bowl: Throwing weapon. Does average damage and multiple attacks. Greatsword: Like the broadsword, but does a bit more damage and has a higher chance to miss. Hatchet: Does above average damage, hits most of the time, but doesn’t do multiple attacks. Halberd: Does above average damage, retaliates sometimes and does multiple hits. Misses alot, unfortunately. Bumps: A large wooden club. Does alot of damage, but misses alot too. Not very useful against high agility opponents. Iron Mace: Similar to the wooden variant, but it seems to be more accurate. Does loads of damage! Stone Hammer: Does even higher damage than the bumps and the iron mace, in exchange for a bit higher missrate. Trombone: Does about above average damage per hit and often hits multiple times. Pretty good! Scourge: A flail. Definately among the best weapons in the game. Definitely among the best weapons in the game. Does insane damage, and seems pretty accurate. Pets: Pets are one of the strongest assets a brute can have. Important is to note that your brute can have multiple of the same pets at once, and also multiple different pets. Your brute starts out with all the pets he has by his side. The weakest of all pets. Takes about 20 damage before it dies, does about 4 damage per attack, attacks 2-3 times. Stronger than the dog, this pet does about 12 damage per attack, and attacks very frequently. It also dodges incoming attacks. The best bonus your brute can have! Can deal and endure a LOT of damage! Brutal Legend: Make it to the finals. Brutes only receive experience when initiating Attacks, therefore attack equal level or lower brutes to progress faster. Getting Pupils* adds to your experience. You cannot Delete a Brute, If you do not use a brute and do not password protect it then it will be deleted on server cleanup (Thereby freeing up unused names). 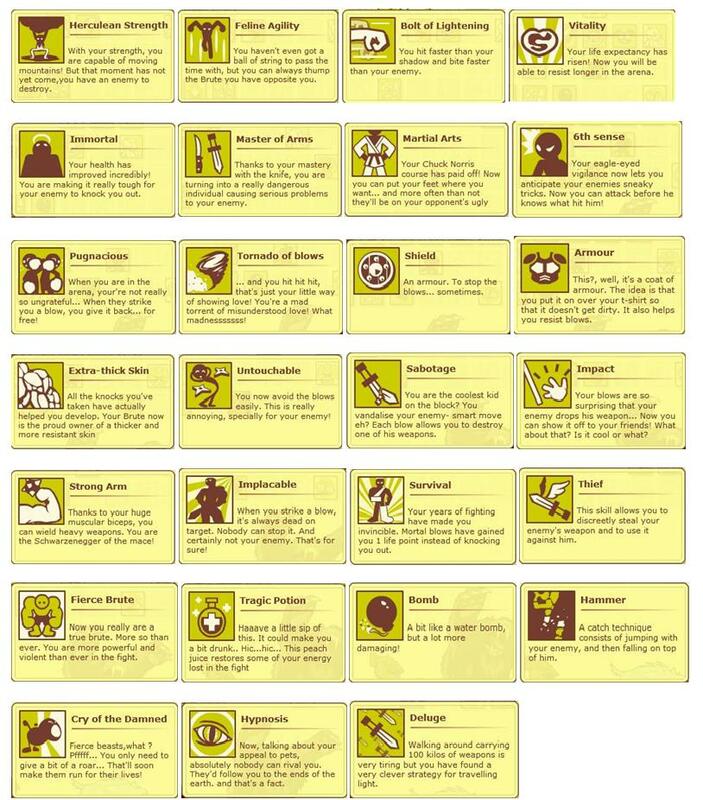 All skills, weapons and animals all seem to be random. You will receive a new one each level. You cannot modify brutes in any way. You can Join and leave clans at will. If you win a battle you initiated you receive 2exp unless your opponent is 3 or more levels below you then you receive 1exp. If you lose you receive 1exp. When your Pupil* initially joins and when it makes a level you receive 1exp. Tournaments can only be played every other day. In order to progress UP ranks(not levels) you must win in tournaments. Server Resets 6pm EST so use your fights before that! Look for a character with a bear pet and pupil him/her. One example is My Brute right here. Level your brute up to level 3 as that’s the first chance you’ll get a pet. From there you have a 30% chance of getting a bear every time you level! see, isnt it easy as 1,2,3? GOOD LUCK AND ENJOY!! Think you can add more to the MyBrute Guide? Post a comment and share your thoughts. If you want a quickway to level up though, there’s always MyBrute Cheats and MyBrute Hacks for you. thanks man. put your pupil name as ‘BOTyourbrutenameBOT’ and ill return a brute to you. If youlevel that brute up, ill do the same too. Come join my clan and we can power up together! This is only a theory on how to get a pet (a bear, panther, or a puppy) but most people say that it really works. How? Well they say that your master should have a pet. Some say it makes sense because the master should teach you on how to get one, thus giving you a higher chance of getting a pet. They also say that after being a pupil of someone that has one, you should level your brute to atleast 3-5 before you can get one. I have a Pet Bear and a Pet Dog… if what is stated above is true then if somebody becomes a pupil then there is a high probability of getting a bear (Be one of my Students). 1. First, create a new MyBrute character but make sure that your name uses exactly three vowels. Vowels are the letters A, E, I, O and U. An example is my MyBrute character which uses exactly three vowels – A, U and I. It doesn’t matter how long the name or if you use numbers, as long as there are only three vowels. 3. Level up your character until Level 3, which will take you only a few minutes. The pet will appear when you reach Level 3. It will be random, you might get a pet dog, a wolf or a bear. There’s no guarantee which but for sure you will get a pet. 4. That’s it! Easy and takes only 5 minutes to do. So you can do it again and again until you get a pet bear. do you want up fast?? -before create a password, the password must begin whit 123!! I began yesterday and i,m level 5!!!! I got a bear as well. I love it, I can’t tell you have many close calls I have had thanks to him. want a panther i got that too! Order him his(her,your) mail and he(she) says to him(her) like to rise of level without need to fight so much!!!!!!!!!!!! is there any way to get a pet if your master doesnt have one? and can you only be a pupil of one person? just put “MH” then the name of your brute. Pupil this guy and you’ll get a bear AND two dogs once you hit level ten. then i pupil you 2 get more exp. you must have a master whit nevel 50!!! I,m he……begin a new brute whit me…. are you dare to challenge me?? do you have a picture of leek or scrouge? 100% guarantee to get a bear. All i have to say is if you want a bear or a wolf, pupil me http://khgjghra.mybrute.com/ Guarantee a bear or a wolf, sometimes both. Rare but it happened to 3 people. is that a way to increase your chances for a wolf? why havent i gotten any exp from my pupils? because brutes have to be created from an IP that haven’t created brutes in the first place. i will pupil you back with a brute named draconum!!! I have a bear too!!! join mybrute please.. thank you.. If you need a bear, pupil my brute, i had a bear and a dog at lvl 3! Start off with an advantage over everyone. give you a brute with one. Level 12 with bear. Join with your brute name and 9 in front and I will reciprocate. my brute is pretty neat, please become my pupil! became my pupil. . .
how can you recruit pupils in mybrute?? If you are looking for a bear, pupil my brute, it had a dog and a BEAR at lvl 3! At lvl 3 you have a really big chance of getting a bear! best of luck ciao! let us make our brute the strongest!! If you’re having problems getting a bear or a wolf this can help http://lethal029.mybrute.com der is a big ratio if your master one w/ the bear try leveling up to level 3. I have a wolf and a dog. If u pupil me u have a 30% chance of getting a pet by the lvl3! You will get a pet, I tested it a few times, 9 times out of ten you will get a pet! I noticed after gaining a level, you regularly get challenged by a whole army of brutes, instead of just one or two per day, as usual. Even if you hurry back to your cell immediately to find out if you gained a specialty, there’s a good chance the level message was already dropped from the screens by all the fights your brute does the next second. An idea what’s that about? Try this http://p013.mybrute.com to get a bear! now i create my character dralnux.mybrute.com this game is very cool. I found out how to get a pet. 1. On a Computer outside your home IP address (this is KEY for it to work) go to http://gix110.mybrute.com and become his pupil. You need to use a computer with an IP address that has never been to the mybrute website. 2. make sure that your name uses exactly three vowels. Vowels are the letters A, E, I, O and U. It doesn’t matter how long the name or if you use numbers, as long as there are only three vowels. 3. try leveling up to level 3. You have a 33% chance of getting a bear. If it doesnt work try again on a different IP address (try different locations, libraries, computer stores, your friend’s house). Eventually you will get one, it’s a sure thing. i noticed you have a weapon missing. i saw a coffee cup-like weapon. the person who has it is called benjammin. You will unlock a bonus arena plus get double exp for three days, which is extremely helpful. Level 13 with bear and dog. Will do pupil trades. Add #1 in front of yourbrute name. fight me–dead-boltx18 if you beat me ill pupil you. plz pupil me if you lose though. how do you select what stat gets the boost? i am a lvl 4, but the only stat that has gone up is Agility, but it only happened for 1 point. HELP! i have a bear in lvl 2 with this brute, it will work on you too1!!!!! oh i got a bear too, thanks a lot, i did it in lvl 3!!! thanks dude!!! ARE YOU ESTONIAN and LOOKING FOR A CLAN? Want to join a clan that IS IN THE RANKING among the first top 1000 clans on mybrute? ps. also if you are not estonian you can join too but plz. be lvl 6 or up and play frequently. If you want a powerful brute, just pupil me http://64565654.mybrute.com/ . Still the best, still undefeated. Guarantee you to get a bear , wolf or sometimes both. (30) pupils all of which have leveled… and not one increase in exp. master my pets so you can get one too..
if u play my brute for ipod touch or ipone and u need a master my code is GJCICIFE! if you do you get double exp and a great chance to get a bear or a panter seeing as i have both. join now!!!! Join my dojo and you’ll get double exp for 3 days, a new arena, a special power and a chance to get a bear or a panther. berserk Soul ranking! U ROCK!! I Got a wolf at lvl 2 witch is imo better then a bear becaus it can hit up to 4 times in one turn. And a bear only once. become my pupil and have a chance to stay undefeated like me!